A sloping plot can be both a blessing and a curse. Once the house is constructed, the advantage of waking up to a stunning hillside view can be breath taking, but getting there can be fraught with unexpected costs and difficult decisions. Some of the disadvantages of building on a sloping block are outlined below, followed by the advantages and two popular construction methods. Before purchasing a plot of land with a significant gradient it’s worth considering accessibility. Will the home have a very steep driveway that will be difficult to access during colder months, perhaps if it is very wet or windy? When accessing the home on foot, will there be many steps to climb which could render the property inaccessible for those with walking difficulties? Access is a common issue that is overlooked when thinking about building on a sloped site, but if you can’t easily get in and out, or have to do twenty trips to get the groceries through the front door, it quickly becomes un-liveable. Another issue with accessibility concerns the construction phase; builders may charge more to work on a site with very difficult access as larger machinery may not be able to operate, making the actual construction take much longer. Drainage problems can crop up in any home, but on sloping site this can be extremely dangerous. Mud-slides can literally move your home downhill or destroy it all together. In climates such as the Whitsunday region where the wet season is indeed very wet, it is imperative that proper drainage be installed in the site and it is regularly checked and maintained. Cutting down trees on a sloping plot where you intend to build a home is a definite no-no. Established trees have vast root networks which are supporting the land, cut these down and you could have a real problem on your hands. The main attraction of building on a sloping plot is the ability to take advantage of a spectacular view, and the Whitsunday region is certainly not short of those. Waking up to the crystal ocean surrounded by forest overlooking small towns and harbours can be emotionally sustaining, the value of which cannot be underestimated. The two common construction methods used for sloping sites are poles to support the structure above and retaining walls. 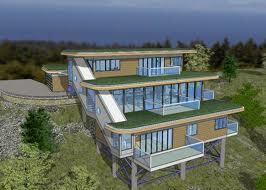 Pole-homes are dwellings supported by a series of poles which raise the floor level above that of the slope. This causes the least disruption to the environment as the home is partially raised above the ground, so the flora and fauna remains undisturbed. Pole homes can be advantageous concerning the stability of the plot as disturbing as little of the environment as possible leave root networks and natural drainage intact. A home built using the retaining wall method is quite the opposite in terms of environmental disruption. The site must be excavated into level platforms which continue up the site, covering the footprint of the new dwelling. When building with retaining walls it is essential to thoroughly research all the considerations listed above to ensure the longevity of the building. 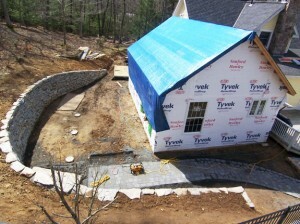 For more information about pole-homes and constructing with retaining walls, contact Brian of Allenbuild. Brian has both knowledge of the region and experience with building dwellings on sloping plots, so you can be assured your new home construction in the Whitsundays is in safe hands. Master Builders QLD is an organisation which speaks out on behalf of the building and construction industry throughout the state. As the voice of over eight thousand members, Master Builders Queensland supports its members, helping them to deliver a quality service to their clients. Master Builders keep their valued members up to date with all regulation additions regarding the building industry. From health and safety to sustainability and grievance advice, Master builders are there to help their members, which in turn help people to get the best building services available. Providing quality training courses is paramount at Master Builders, always giving members the opportunity to add to their knowledge and skill sets. As of June 2011 Master Builders QLD supported 3,654 members across the state in the building profession. For figures relating to regional membership spanning all professions, 4% where located in the Whitsunday and Mackay region. Based on these figures, approximately 146 Master Builder members in this region are in the building profession. Although the populations in these areas are comparatively low to the likes of Brisbane, there is plenty of new home construction in this area. Understanding and following the regulations for Australian home building is essential to a Master Builder member. Regulations have changed over recent years and how homes are rated based on their ability to achieve targets regarding sustainability, energy transfer, access and material selection. One registered Master Builder in the Whitsunday and Mackay region is Allenbuild, a building company with over 35 years of experience in the industry. Allenbuild is the Whitsunday builder who is always up to the minute with new regulation and takes great pride in producing quality homes in the Mackay and Whitsunday area. The Whitsunday region is a beautiful part of Queensland, but one that experiences extremes of climate. Employing a builder who is certified with the leading building association in Australia gives new home builders peace of mind when selecting the right contractor for their project, with the knowledge and experience to construct a home built to last.